Train your dog:It’s always a good idea to ensure your pet has properly gone through successful dog training lessons before you take it out on a leash. Start at a young age and work your way up with the basic commands so you know that your dog is capable of following instructions. Then you can always take your puppy to a professional dog training school in order to get it even better trained. Depending on your budget, these can be quite expensive but they do work out in the long run! Use a leash:This is the most obvious step and will save you a lot of hassle and time. A dog without leash can become a pesky dog in public. A bored, unruly, unleashed dog often bites child. If you are capable of successfully implementing off leash training then by all means go for it, but no dog will automatically know how to walk without the aid of a leash. Make sure you have a strong leash that won’t break as well as a sturdy collar that isn’t to tight around your dog’s neck. 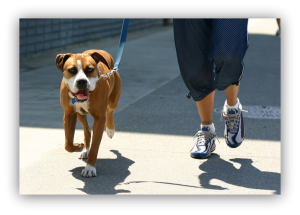 Always make sure you can control your dog while loose leash walking and that it doesn’t hurt your hand too much when your dog pulls. Check the area in which you walk your dog:Some areas and parks do not allow dogs so you should save yourself the hassle and trouble of finding that out when you get there by planning and checking ahead. In doing so this also will let you know what precautions or equipment you have to take with you if dogs are allowed. You may need to take a special type of leash or only keep your dog confined to certain areas of the park, but all this information is vital in order to maintain control. Clean up after your pooch:You can either invest in a proper pooper scooper or just simply take with you a plastic bag. It’s not a pleasant experience to tread in doggy doo on a walk so save the hassle of people doing exactly that by always cleaning up after your dog or ensuring your dog relieves itself well off the path where people walk. Bring plenty of water:Not only for you, but your dog also! Dog’s are just like humans and need constant hydration in order to stay healthy. The last thing you want is your dog to be constantly panting the entire journey so bring with you a bottle of water in which your dog can easily drink out of or purchase water on your journey. Take plenty of breaks:Your dog gets tired just like you, so always find ample spots in order to take a break. 10 minutes here and there is a great idea so find a nice shaded spot in which you can both just sit and relax before commencing your walk again. You could always take your dog to a nearby beach if the weather is suitable and both go for a bit of a swim. Bring identification:Sometimes dogs can wander off and get lost, so make sure that your dog has a collar with its name and phone number on it if that’s the case. You should also make sure your dog is correctly registered within your local council to avoid any potential fines should you be spotted by a council official. Is your dog up to it? :If your dog is healthy and fit enough then it should be fine, however if you have an older dog that you may think will struggle then you should either limit the distance you go for a walk or reconsider it all together. You can always take a nice short walk around the block but always make sure your dog is capable in doing so. Vaccinate your dog:As you would with your child, make sure your dog is correctly vaccinated to ensure that it can’t catch any nasty diseases from other dogs it may come in contact with. You should know when to take your dog to your vet in order to check the latest vaccinations that are available. Soon you will have a constant walking companion to keep you company when you feel like exercising, and it will benefit you both in the long run! Dog walkers should check out various jobs which offer them compensation for walking dogs. 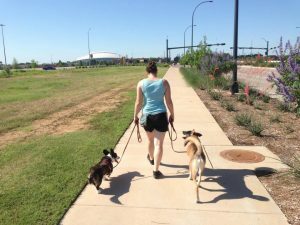 Many dog walkers are needed to keep a dog active, amiable, and a loving pet for kids.